We made sandwiches and then headed out for the famous North Shore, where all the surfing is happening. All the surfing happens in the winter though, and we weren't expecting anything other than gentle waves today. 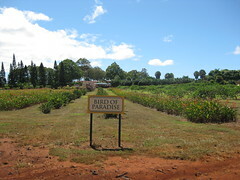 We would save driving up the Windward coast for another day - today we would drive up the 'middle', along the H-2 and 99, via Dole Plantation. Could we find H-2? Could we heck! We got lost around Pearl City and had to turn around - in the process, we encountered a near-death experience as some driver overtook the car behind us and hadn't seen us, thus nearly barging us into oblivion. 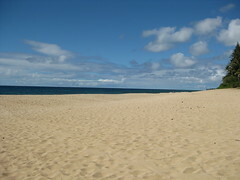 Oahu has a land area of 607 square miles, a coastline of 112 miles and is 44 miles long and 30 miles wide. That is, it's not very big and when you see, what looks like a largish lake, on the map and think to stop there for lunch, you actually get a duck pond. 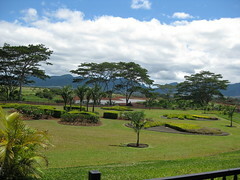 It was a very short distance to the Dole Plantation though, so we ate our lunch in the carpark there, although I was loathed to keep the doors open, fearing hitchhikers in the hideous form of cane spiders, which I'd read about with utter horror. They get to be 4 inches across, have legs like tree trunks and jump at you. They exist wherever there was once cane plantations and are expert at making themselves at home in your car while you doze the afternoon away, only to be confronted by the creature, later, on a busy highway, peeping at you from the steering wheel. The good news is that they are harmless. 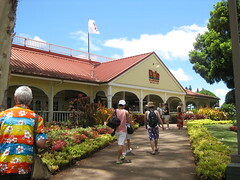 Dole Plantation is one of those tourist traps; they promise you the world's largest maze and ... pineapples. But you have to stop! 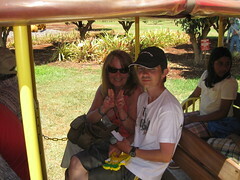 Actually, we rather enjoyed our visit, which started with a successful ATM transaction for Paul. Which is more than can be said for the hub. Here we go again! Lloyds were denying us money, just as they had in Chicago last year. And, that morning, as hub had tried to book our tomorrow submarine trip, our Capital One card had been denied! Good job we have hundreds of credit cards ... 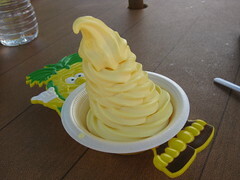 But, you cannot get too depressed in life when there are Dole Whips! These are, apparently, legendary, and so they should be! Yum! 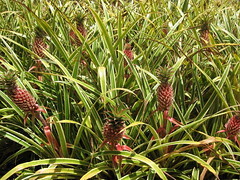 T had managed to secure ours in little plastic 'pineapple man' dishes and we weren't sure what to do with them. We decided that we had probably paid for them and that we should keep them. 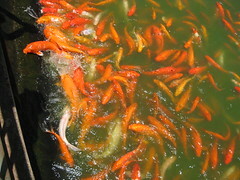 So we fed the huge koi, who frenzied and jumped out of the lake - and strolled around the gardens with their many assorted pinapples. 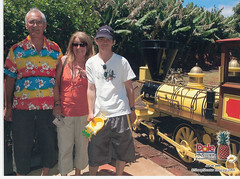 ... and then we bought tickets for the train, the Pineapple Express. 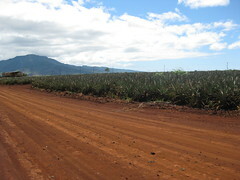 It was quite an enjoyable 20 minute or so, chuff-chuff around the pineapple plantation. The (quite interesting) commentary was interspersed with some Hawaiian music which they were obviously trying to flog in the shop. 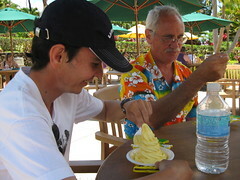 We only bought pineapple-shaped things - and Paul bought T-shirts (one for me! ), which left little of the money he'd taken out at the ATM. A quick check for cane spiders and we were off again, driving the short remaining distance to the North Shore and, firstly, Hale'iwa. We drove through, but didn't stop. I was a bit miffed about that (although I hadn't asked to stop) - I'd thought it was obvious we were meant to stop for shaved ice and the like. But no. 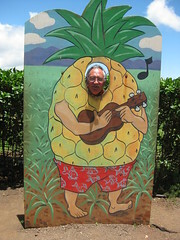 So, when we parked up at Papa'iloa Beach, I was still miffed. We had to climb down a little slope to get to the beach and it was glorious. Though hot. I asked how we were meant to sit there without an umbrella (an unreasonable thing to say, but, remember, I was miffed), so we marched back to the car. We stopped at lots of other beaches, but there was no shade and no shop selling umbrellas. We tried to park at Waimea Bay, but there were no spaces. Finally, we parked, under a banyan tree (I so love those) and walked down, through the trees, to Sunset Beach. Wow, I kid you not, the sand stretched for about as far as the Cornwall coast! 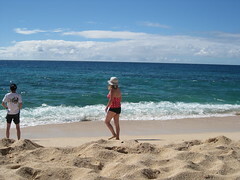 The sand was white; the sea turquoise and there was hardly another soul in sight! Of course, there was no shade and, of course, there were no umbrellas, but we managed to sit there for a half an hour or so. Paul and I paddled, but it was no place for swimming, regardless of it being summer-time - the currents were very strong. We could hear a car alarm in the distance. 'WHAT?' How many times had I told him that you must not leave anything in the boot! But why break the habit of a lifetime and listen. He pulled on his shorts and marched back to the car, with Paul and I following (slowly) behind. We had all the gear to carry, of course, it was hot, and the sand took some effort to negotiate, uphill! It hadn't been our car. We were lucky. 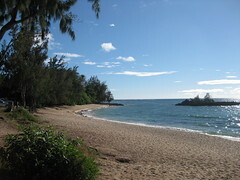 We drove up as far as Turtle Bay, at the end of the north shore, stopping to gawk at several beaches, before retracing our route back along the shoreline. 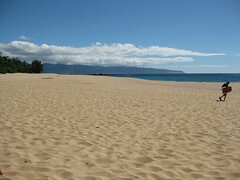 We stopped, at (I think) Waiale'e Beach on the way up and back. For some reason, I'd thought it was Turtle Beach and had hoped to spot the critters. But it turned out not to be that beach and there were no turtles. I said we must have shrimp for supper. Shrimp from a truck. 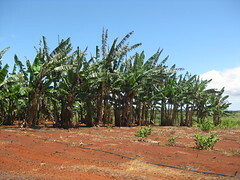 There were many of these, just outside of Hale'iwa. We chose Macky's. 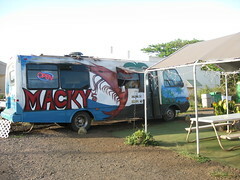 'Hi, you been Macky's before? ', boomed the Japanesey-looking man with a smile from ear to ear. We told him 'no' and he went through the menu for us, explaining what treatment had been given to which shrimp. He was so very enthusiastic! T ordered the 'lemon', Paul the 'garlic' and I had the 'plain'. The plates were delivered to us with nods and fervent wishes to 'enjoy' - and we did enjoy! 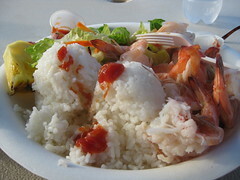 Also on the plates with the shrimp were salads, rice and pineapple (of course). We shared our shrimp around and I think the lemon was the tastiest. Beside the truck was a bin to scrape our leftovers and a sink to wash our hands! I needed the toilet. OK, there had been a toilet outside Macky's, but it was one of those steel boxes. There was a McD in Hale'iwa. The boys felt that, as I was using the toilet, they should buy fries. And, amazingly, after all that shrimp, they added burgers to that ... We fairly whipped down the middle road, back towards Honolulu. We would've been back quickly, had we not, inexplicably, taken a right turn and found ourselves on the H-3. With no turnings, we had to drive on to Kailua and take the Pale Hwy back ... T phoned Lloyds - no problem - they would unblock our account (well, thank you, why the heck didn't you do that when we phoned you before we went?) - whereas Capital One said they had to cancel our card (WHY?) and would send replacement cards to our home address. Very convenient when you are in Hawaii.